Baller Points are our way of giving a little back to our loyal customers! For every $1 (excl. shipping and taxes) you spend with us, we’ll award you 10 Baller Points towards your next order. There are a bunch of other great ways for you to earn points, such as referring friends, liking The Baller Store on Facebook and sharing our products on social media. Simply create an account on our website and we’ll give you 1000 Baller Points ($10) as a welcome bonus! You must be a member to earn Baller Points. To be eligible to spend Baller Points your checkout total must be greater than $50. 10 Baller Points are awarded for every $1 spent online, excluding taxes and shipping. 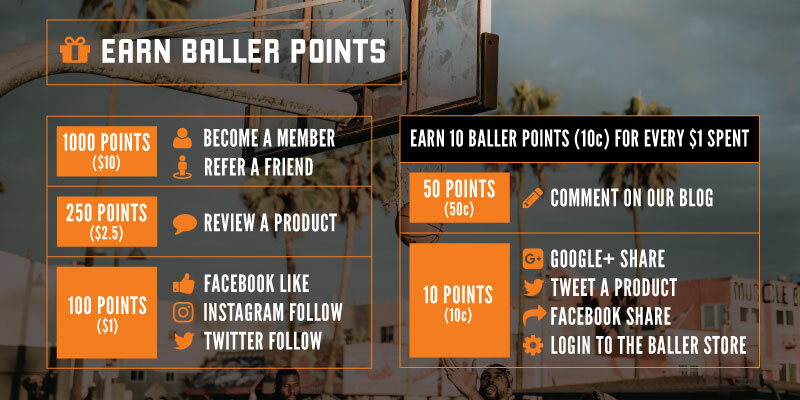 Points may be removed from any accounts deemed to be abusing the Baller Points Program.Shopping cart total must be greater than $50 in order to redeem points. Referred friend must register an account and complete a purchase prior to referral points being awarded. Only approved members who have completed a purchase may leave product reviews. The Baller Store reserves the right to remove an account at any time, and may cease offering of Baller Points program at any time, albeit with sufficient notice for customers to use their points.